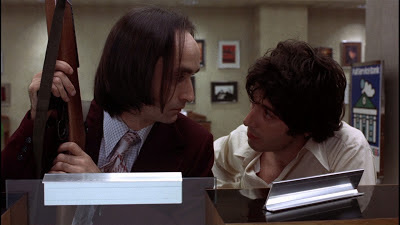 These opening shots are simply to set an atmosphere of a dog day afternoon – a hot, miserable day when nothing is happening in New York – and that of course singing is the wonderful Elton John. When I shot this footage I stole all the shooting, none of it is staged, and the picture was edited by the magnificent Dede Allen, one of the great editors we've had in the movies. In order to bridge this footage for us, which was silent when I shot it, Dede put the Elton John record in just to give us a sound for it. I decided finally that there would not be a score for the movie, there is no music in it and I'll talk about the reason for that later, but when we took the music out we had become so used to it from hearing it in the cutting room I missed it! So we put it back in and decided to motivate it by simply making it part of what was coming through the radio of our leading characters, whom we're about to meet, seated in front of the bank. About the third day of rehearsal I said, "Look, no characterisations here, use yourselves. In fact, we're not even going to dress you, I want you to use your own clothes as costumes, and let's just use our own real names so we develop the habit of dealing with each other as we really are." At that point, one of the actors, I don't remember which one, said "What about language? Can we use our own language, our own words?" Now, Frank Pierson had written a magnificent script that I accepted, Al accepted, and we were all thrilled to be working on, and in general I don't like actors to improvise. They are not going to come up with something that's better than a really talented writer who has done months of work on something. So with Frank present at rehearsal, the solution I came up with was as follows: if they wanted to improvise a scene, to find out the truth of it, they'd be perfectly welcome to do that, but we started to record the rehearsals. At night, Frank and I would go through the transcripts – we'd have secretaries type them up for us quickly – and we would compose the script in large part out of these improvisations. Frank was a willing participant in this, he saw the reason for it, and it's to his everlasting credit, and it shows you his healthy ego, that he didn't believe every word of it had to be his. Structurally, we never deviated from what he wrote, we didn't mess around with his script, and all we did was allow the actors some freedom. Even if they began as improvisations, by the time we got to shooting a complete text existed and we were working off a fixed script based on many improvisations. Here of course is the wonderful Charles Durning, a magnificent actor. It was the first time we had worked together but he was really quite amazing. I did something with Charlie on this that I never would ordinarily have done. Believe it or not, Charles was actually doing another picture in California at the same time that he was shooting this, and there is only one other director I would have trusted to be as efficient as I was in keeping to schedule. That other picture was being directed by Robert Wise. I spoke with Bob and we trusted each other, so when Bob told me "Charlie will be free on Wednesday so you can have him on Thursday" – and vice versa – we trusted each other and Charlie was commuting between Los Angeles and New York, playing one part for Bob and this part for me. We were both lucky. We're coming up on Attica. Here comes a scene which I'm thrilled to say has become sort of a classic in movies. Totally improvised, it's Al going bananas. He lost all sense of text and, as happened with the real character, got very excited by the crowd's reaction to him. That started to feed him and he started going crazy with it, and the crowd started joining in and they were feeding each other. It became totally hysterical. Attica, for those of you too young to remember, had been an infamous moment in New York correctional institute history. A prison riot broke out, and after many days of tense negotiation, Governor Rockefeller ordered National Guard troops in, and I think 19 prisoners were shot and killed, with no officers injured. One of the horrors was the fact that I think almost all of the prisoners who died had been shot in the back, and it became infamous, the Attica prison riots, a great black mark on the part of correctional officers. Al is just sailing now, and this shot I love more than anything, a camera in a helicopter shooting a helicopter over a scene. One of the most interesting things, and one of the reasons I'll always admire and love Pacino, is the risk he was taking. He was now a big star. Godfather 1 and 2 had happened, and after those performances – the macho, controlled, ice-cold person in those movies – to suddenly play a homosexual in love with another man, and for whom this whole wild experience is something that's so alien to most of our lives, to take that risk was enormous. He was nervous at the beginning of it and a great many actors find some source of security in makeup, it's as if they can hide behind something. In the beginning, Al – being nervous and being aware of the risk he was taking – was quite worried, so he thought maybe he could use a moustache. On the first day of shooting he turned up with a moustache, and I understood what was bothering him. I wasn't crazy about it but if he got some comfort and solace from it, and if it released him emotionally, that was fine with me because there was a bigger purpose at work here. He looked at himself at rushes the next day, and he looked at me and said, "It's wrong, isn't it?" 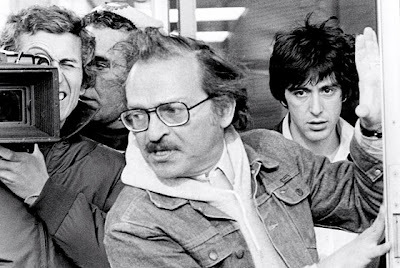 and I said, "It's wrong, Al," so he got rid of it and we re-shot the first day's work. But that's so much a part of his devotion to his work, he is a consummate artist. My favourite line in the movie. If you notice that stunned look on Al's face, it's because John was not supposed to respond to that at all. In the script, when he's asked if there's any place he wanted to go, he wasn't supposed to say anything but on the take John said "Wyoming." I almost ruined the take because I started to laugh so hard and I didn't want my laughter to get on the soundtrack. It was a brilliant, brilliant ad-lib. The crowd was also a fascinating group. One of the reasons I liked to shoot in New York is that our extras are actors who belong to Screen Actors Guild. In California, they have something called the Screen Extras Guild, and there are people who are not actors, they spend their lives as extras and they have no ambitions to be more than just an extra. That in turn means they cannot respond to a situation realistically; in fact, in California the director is not allowed to address the extras directly. If he does they are called what is known as 'special bits' and their salary goes up for the day. In New York all of the extras are just normal actors, a lot of them working off-Broadway, so I could talk to them as actors and treat them as actors. We had 300 actors doing the parts of the extras, and they were magnificent. Burtt Harris was the assistant director, and Burtt or I would address them about what was happening in the scene and what their reactions should be. Of course, because we were shooting on a public street we had it zoned off for ourselves in terms of traffic, but I knew that after three o'clock, when school broke, the normal civilians who lived in the neighbourhood would be coming around and there was no way of keeping them out. Burtt and I talked to the actors about how to involve the local civilians. We didn't want to exploit them, we paid them, and our nucleus of 300 actors were absolutely marvellous. They involved them, they talked to them on the level of the reality of it, not "Hey folks, you're making a movie" but "Hey folks, what do you think is going on inside that bank?" and as a result we would sometimes have 500 or 700 people out in the street. I never lost a take because of a fake reaction on the part of the crowd, and that I owe completely to the 300 extras who were really fine New York actors and coached the crowd along. One of the things that you hope for in a movie is a good relationship with an editor, and most of the time you do have it. However, there are certain editors who come onto a picture with the attitude of "Now that you're finished shooting we'll save this piece of crap." All these clichés say movies are made in the cutting room, but they're not made in the cutting room, movies are made when they're made. No editor ever put something up on the screen that wasn't there, that hadn't been shot. When you work with Dede Allen, you work with a consummate artist. I remember reading once, on a picture she had edited, a very fancy critic writing about how she could recognise the Dede Allen touch in the editing of the movie. The person who would have been absolutely horrified to read that would have been Dede, because the thing that she prided herself on was her service, as she called it, to the director. Her editing style was whatever the director had given her and whatever the director's intention was. The results that she had with me, the results that she had with George Roy Hill, who used her all the time, and the results that she had with Warren Beatty, who wouldn't do a picture without her, are completely different in the editing, because we are three very different kinds of directors. The idea that she would have a style over and above what the director wanted out of a movie would have made her laugh. She was much too good an artist for that kind of approach. The reason for no music is that, as you'll see from the story that develops here, this truly happened. It was so important to me that the audience believe it really happened because what happened was so outrageous, and I could not reconcile trying to convince an audience that this really happened – which I felt was the first obligation of the movie – with putting a music score in. How would it have felt if suddenly in the midst of a sequence you heard an orchestra? One of the things I find so enchanting about Pacino, who is very possibly a great American actor, is his ability to combine drama with comedy. Always being totally honest, always playing the situation in complete truth, and some of it so hilariously funny it's a miracle, as you'll see in just a moment. That incident with the box and the gun not getting completely clear was absolutely in the moment. It was totally improvised, it happened and Al used it, and of course it's one of the first totally ridiculous things that happens. You'll notice that a lot of the staging is very casual, people in the foreground, nothing rigid, nothing formal in the staging in relation to camera. Normally for instance you would ask the guy on the right, "Step back a little, you're blocking Jimmy a bit," but not in this picture. If you block him a little bit, just fine. The way some of the detectives are dressed is part of the genius of Anna Hill Johnstone, who did the costumes. I don't know if you saw that quick shot of a detective with checked pants, a brown jacket and black shoes, but it is so typical of the way police dress. It started on this picture, and I don't know why I noticed, it, but a lot of cops wear white socks all the time and to this day I always wear white socks. Penny Allen, who is playing the chief bank teller, and her husband Charlie practically raised Al when he left home at a very young age to become an actor. Penny and Charlie took him in, and Al lived with them until he was in his early 20s. Burtt went up to photograph the helicopter stuff because I am a complete coward and hate heights. One of the great pleasures of my life is doing the sweat myself. I never leave it to the makeup people to do it because they always do it either too much, too little or too fake. From Twelve Angry Men I learned how to do the sweat myself. It's a combination of glycerine and water, so it lasts a long time and you don't have to do it on every shot. It looks real, it doesn't run the way some of them do when they just use water, and I can keep the continuity correct. I don't know if the movie would have the same impact today. First of all, gay life is now so much more familiar to us. At the time it really had a shock value, and because it was the first of its kind there was an extra level of discovery to it, which I don't know if it would hold true today. However, it is a profoundly human experience despite the strangeness of the people involved, including the Judith Malina character, all of them are very odd people. So perhaps it would work, I don't know.